Following the Islamist takeover of the key Somali port of Kismayo, residents of Baidoa, the last town in government hands, fear they could be next. With the US accusing the Union of Islamic Courts of having links to al-Qaeda, some fear they could end up hosting the next stage of the "war on terror", with devastating results. "The government is passively watching as the Islamic militias continue to extend their power into new areas," said resident Mohamed Bashir Issaq. "I am afraid, one day, the two rivals would wrestle here with the help of foreign powers." Since the UIC took Kismayo, witnesses have seen hundreds of Ethiopian troops in 50 battle wagons heading to Baidoa. Ethiopia, which shares US fears about Islamist extremism, is a close ally of Somalia's government but denies that its troops have crossed the border. But shop-worker Kaha Sheikh says the Ethiopians will guarantee Baidoa's security. "Baidoa is not as easy as Kismayo because of the presence of Ethiopian troops, who have come to help the government," she said. "Also there is the political weight of the internationally recognised transitional government. I think the Islamists will simply not venture to attack here." 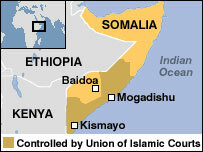 Baidoa residents have more reason than most other Somalis to fear renewed conflict. In 1991, at the start of the country's 15-year civil war, thousands of people died here of hunger and malnutrition as rival warlords battled for the town. 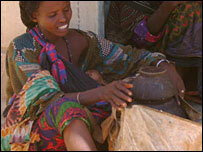 In a country where nearly everybody was suffering, Baidoa was nicknamed "the town of death". "I lost my only three children and their father in different clashes in Baidoa, between 1992 and 2000," said Khadiija Abdi Ahmed, 36. "Now, I am married again and have started a new life. More fighting in this town would mean the end of my life." A senior security official in the town says government forces have been put on high alert. But there are no more soldiers patrolling the streets, as they have all been confined to barracks. Security was first stepped up last week, after a failed assassination attempt on President Abdullahi Yusuf outside the converted warehouse used as a parliament building in Baidoa. It is still not clear who was responsible but the Islamists have denied claims they were behind it. Despite the fears, on the outside, life is carrying on as normal. Although the government has not yet set up a civil service, many people have come to depend on it since it arrived in the town last year. Hotels, car-owners and communication firms rely on the custom of MPs, as does camel milk-seller Faduma Madey. "Before the government I used to spend the whole day here, selling milk without much benefit but now, I sell all my milk in a few hours," she says. "I believe this is the result of peace, God save our town from another conflict." Traders say the prices of most basic items have fallen by about 20% since the government established itself in the town. 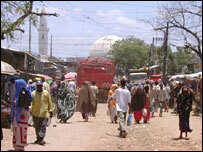 But businessmen say food prices are still more expensive than in the capital, Mogadishu, which the UIC seized in June. In Mogadishu, the check-points manned by gunmen who used to extort money from passers-by have been dismantled, leading to a fall in prices. Part of the road between Baidoa and Mogadishu is manned by freelance gunmen allied to neither the government nor the Islamists. "Our goods pass through eight check-points where gunmen impose taxes," said businessman Isgow Ibrahim. He just wants those gunmen removed, to make easier and goods cheaper. But he does not care whether they are taken out by the government or the Islamists.